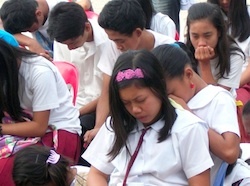 Churches involved in our project reported that as a direct result of our school programs and “Family Festival” crusade, visitors began attending their Sunday services and a Friday night youth service. These churches, located on the small Philippine Island of Mindoro, are excited to have these new Christians as candidates for upcoming baptisms! Plus, they have started four new small groups in neighboring “barangay’s,” which are districts close to the area where we conducted our recent outreach and training project. 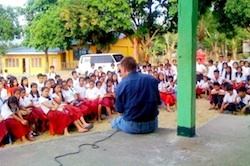 One church shared the following testimony with a member of our Asia team: Four young men came to their church the first Sunday after our project concluded and said to one of their pastors, “We are gay and we want to change…can you help us?” During our school programs I addressed a variety of “life issues” people struggle with, of which one is homosexuality. I shared general explanations as to why a person may drift toward and choose to be homosexual. But I also shared that if people turn their hearts over to Jesus Christ and repent/turn from their past and current sins, He will not only forgive them but, if they are willing, He will also change their homosexual desires into heterosexual desires that can be fulfilled between one man with one woman in marriage. One of our ministry advisors, Mr. Mike Scalf of San Antonio, TX, just returned from the most newly formed country in the world, South Sudan. Mr. Scalf took an advance trip to begin the initial mobilization phase of the project we will be conducting later this year in Juba, the capital of South Sudan. Later this month Mr. Scalf will be representing our ministry on another advance preparation trip to Vijayawada, India, to begin mobilizing churches for our upcoming project there. Please join me in praying for Mr. Scalf, that the Lord will grant him protection, power, provision, wisdom, and discernment in preparing the logistics for these two major projects. Soon, we will share more details of these tremendous doors that God has opened for us! My grandfather on my mom’s side passed away recently triggering grief in the hearts of our family members. The graphic reality hit home in my heart that each one of us is going to die someday—some minute—and that you and I are going to take and then release our last breath before entering eternity. How do we deal with the grief of losing loved ones? And, how can we be sure we (and those we know) will go to heaven when we die? To find answers to these questions visit our website at: www.scottnute.org. It is because of the financial and prayer support from people like you that our ministry is able to be involved in what God is doing to reach and change lives globally! Thank you for your giving and prayers, and for your partnership!